4.1 Thunder installed with isolation downwards to the CPU daughterboard. 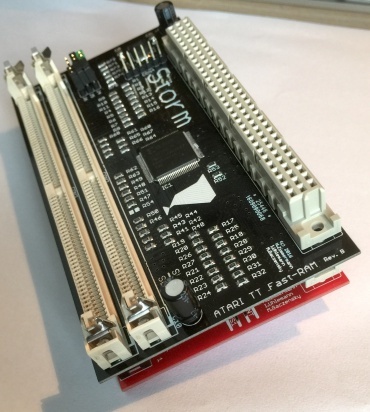 The "Thunder" is an unique interface for the Atari TT, which offers the possibility to connect IDE devices to the Atari TT. It is equal, if you use a hard drive, a CD-ROM or a CF card. 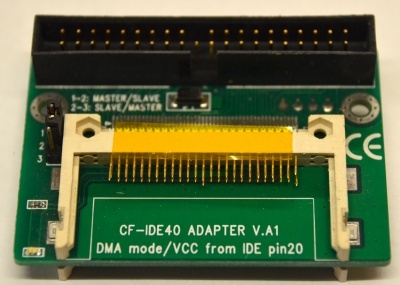 Usable master / slave IDE to CF adapter or even IDE to SATA adapter can be used. 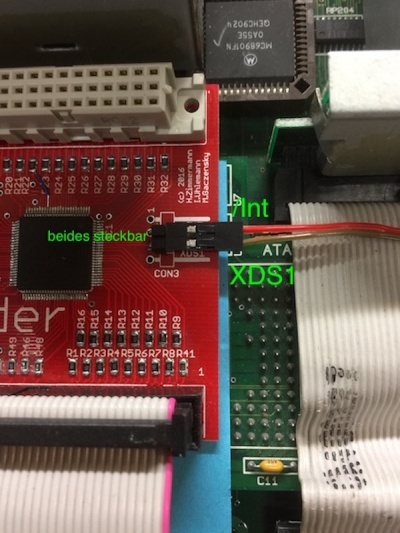 Even SSD devices now works with the Atari TT. The Thunder is a partial plug and play solution. 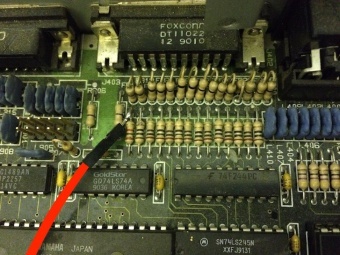 The extension card is plugged onto the TT-RAM socket of the Atari TT (internal slot in front of the power supply, 96-pin connector). 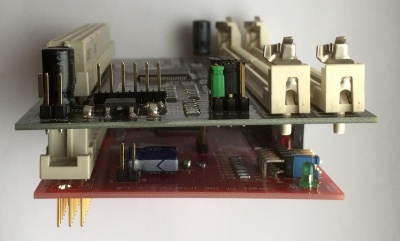 It is only necessary to connect the Thunder with just two cables to the mainboard of the TT. 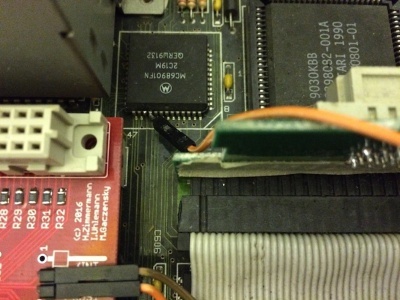 On the Thunder, the 96pin FastRAM socket is looped up and a an coded 40pin standard socket for IDE devices. The jumper block JP1 - 6 is also located at the bottom left (see jumper assignment). The green LED1 signals the operational readiness. 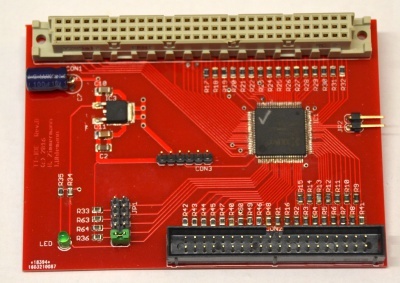 The red LED2 signals accesses to the IDE bus. 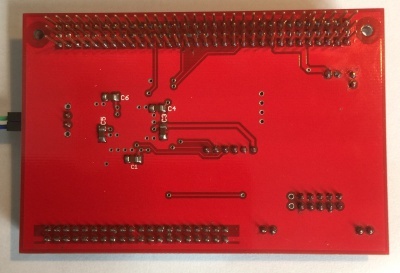 Con4 in the middle as well as the pins GND and + 5V on the upper left are for programming the CPLD - please leave unused and never connect! 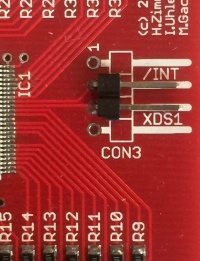 Con3 on the right side connects the two signal lines / Int and XDS1 to the mainboard (see Installation). On some Thunder there are small hardware patches; please leave so. As of Rev. C, it is also possible to route the LED2 "outwards". As of 15th september 2017 there are 4 Hardwarerevisions of the Thunder, namely Rev. A (prototype), Rev. B (= V 1.0), Rev. C and Rev. D. The different revisions have the same features and differ only slightly in the structure, but not in the function. As of 05th august 2017 the actual firmware for all revisions is: 363. This firmware is improved in the timing because there are some very few TT, where this current firmware is needed to work. 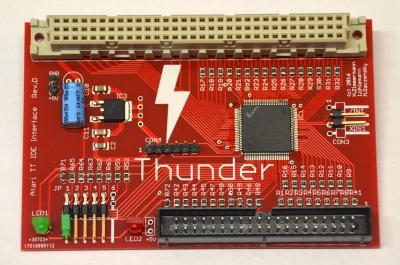 The firmware used is usually written at the bottom of the Thunder. An update is possible. 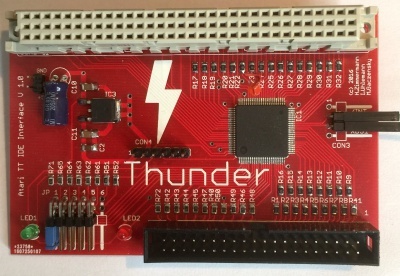 Thunder with older firmware versions do not need firmware update, if there were so far no problems. 1. First, insert the Thunder into the TT-RAM slot. Please pay attention to the correct fit! 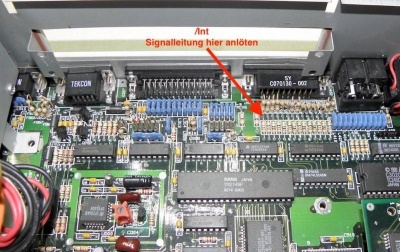 If necessary, the card can also be firmly fixed to the mainboard with two screws. Please insert the card smoothly, evenly and symmetricaly. 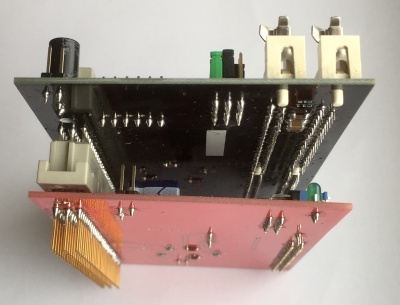 The Thunder has for this purpose a special 96pin connector with longer, gilded contacts on the bottom, which are for this kind of application (so called gilded transfer zone). 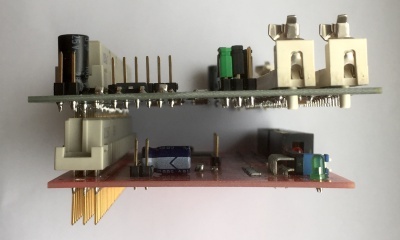 With TT's with Daughterboard or PGA CPU it is sensible to isolate the Thunder downwards for safety reasons, in order to avoid short circuits (see pictures below). A separate power supply of the Thunder is not necessary as this is done via the expansion slot. 2. Two wired connections (signal lines: /INT and /XDS1) are required to use the Thunder. 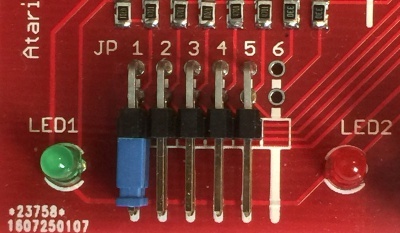 One end of each cable is plugged into Pin2 and Pin3 of Con3 (right side). Pin 1 and pin 4, which are not used, are ground contacts with which the signal lines can be shielded, but regulary it is not necessarily. In principle, the cables should be kept as short as possible. Genuine, pre-assembled and colored cables are included. 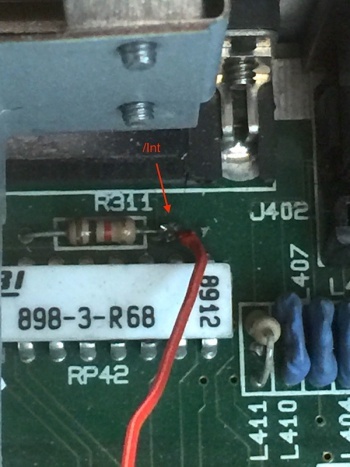 On the Thunder the /Int is the "rear/behind" pin - the signal cable also comes "from behind" on the mainboard. 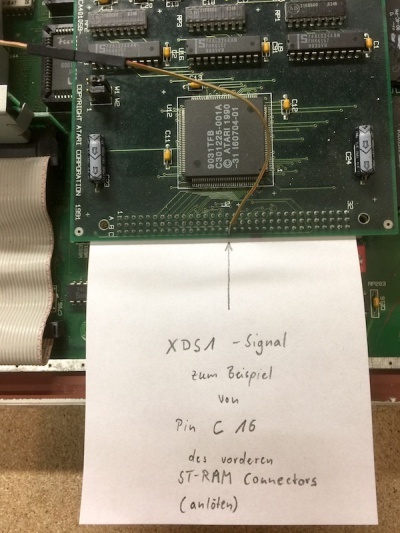 The /XDS1 signal on the Thunder is in "front" - the signal power is also "from the front" on the mainboard. 3. The Thunder is therefore basically ready for use. With an original TOS 3.06 in the TT, because of the peculiarity of this TOS version is only booted from floppy and the IDE extension is put into operation. NOTE: The above TOS 3.06 includes the following patches: WinX 2.3n, SHBuffer, BPatch, RamSizeFit, NewLogo, IDE boot. The patched TOS 3.06 is available in following languages: German, English (UK and US), French, Spanish and Swedish. More is not necessary. 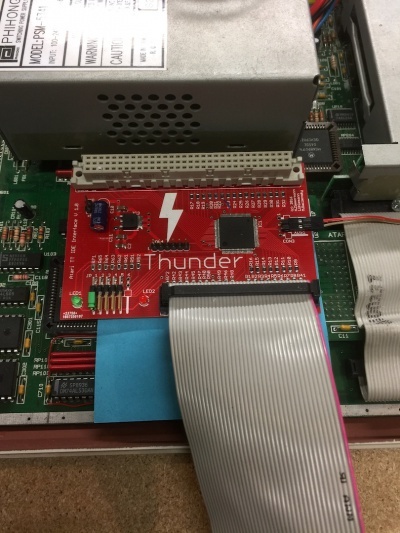 A simple test shows whether the card is correctly plugged in and wired: JP1 from the jumper block of the Thunder pull = off = Thunder disabled. The TT should behave the same despite the Thunder, as without the Thunder. Recommended is the combination with the Storm extension () to reach the full speed. Especially under Mint, this is clearly noticeable during the installation and the starting process. The Thunder was tested with various HDD drivers. 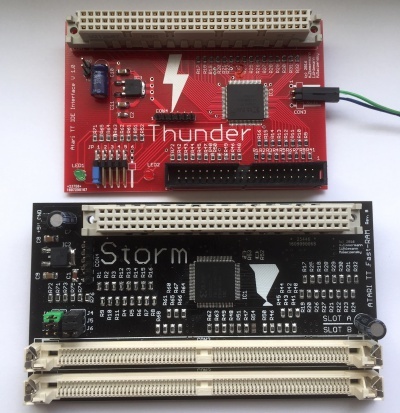 The best performance is provided by the Thunder IDE interface, together with the Storm Fastram card, when the hard disk driver is loaded into the Fastram. For the HDDriver version 10 or higher, a feature was introduced under File -> HDDRUTIL settings (HDDRIVER.SYS in Alternate RAM). 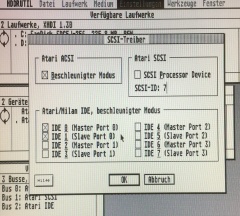 Furthermore, in the HDDriver (also before version 10) the accelerated mode can be set for IDE devices under Settings -> SCSI driver (Atari / Milan IDE, accelerated mode), which not only offers speed advantages for hard drives but also for CF cards (+ 400 Kbytes / s in accelerated mode). In this case, data transfer rates of up to 5750 Kbyte / s can be reached (test program: Xferrate, compared with Falcon, the transmission rate is only 1400 Kbyte / s). Note: when using HDDriver, the C: partition must not be set up with byteswap, otherwise from C: can not be booted. The default setting (bold) is: JP1 on, leave all other jumpers open. JP1 turns on the Thunder. JP1 must therefore always be set, also for the other modes. If only JP1 is set, the Thunder is operated in Falcon compliant mode. 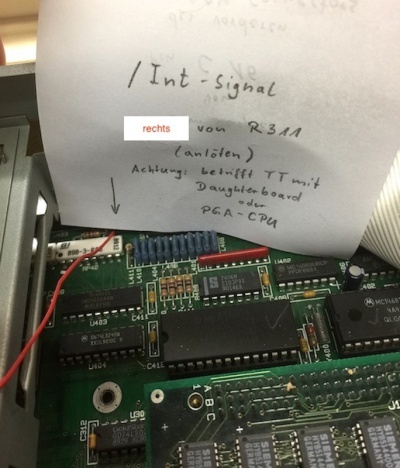 Data exchange with other non-Atari systems is not possible. 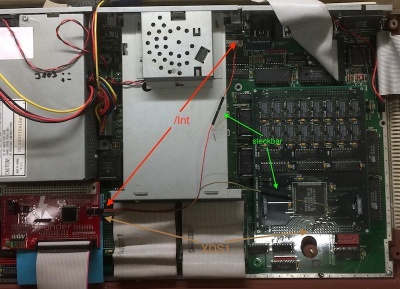 Byteswap is called a mode in which the data lines are twisted (the IDE cable is twisted), this means the lower byte is exchanged with the upper byte during transmission. 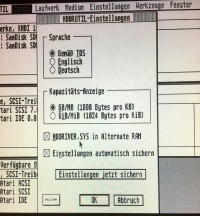 This technique offers the possibility to read partitions created on the PC without detour on the TT without the CPU having to perform a software byte swap. This saves rendering performance. To use the byteswap mode, however, a special HD driver is required, for example that from ppera. The Thunder offers this mode under JP2 for users who want to use the ppera driver with a twisted IDE cable. Smartswap is a modified mode of byteswap mode. 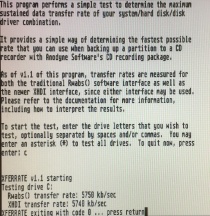 Here, the bytes are only exchanged when actual data are transferred from the IDE device. All other data needed to control the device is not rotated. Thus no special driver is necessary. HDDriver supports this mode. The partition must be created only Windows compatible. The Thunder offers this mode under JP3 for users who want to use the HDDriver and want to use the direct data exchange with a Windows computer or Mac. For this, put JP1 and JP3 on. The data carrier (HDDriver without byteswap!) can easily be exchanged between Atari and PC / Mac, ideal for CF cards. The Slow Mode is a mode that is used with quite old IDE devices. The Slow Mode is only installed for better compatibility and will not be used with newer devices. In case of problems the setting of JP4 can help. Recommended setting: off. For more infos see here . Thunder installed with isolation downwards to the CPU daughterboard. Diese Seite wurde zuletzt am 17. September 2017 um 13:15 Uhr geändert.